Travel with Exotic Bhutan Tours and Treks in this pristine Himalayan Kingdom and photograph lamas, yaks and ancient cultural festivals in Druk Yul, Land of Thunder Dragon. Experience Druk Yul, the mystical, magical, medieval, Kingdom of Bhutan, last bastion of Mahayana Buddhism. Attend tscheus; religious Bhutanese spiritual festivals invoking blessing on all whom attend. Tour ancient dzongs and watchtowers and converse with monks and lamas. Search for the blue poppy and snow leopard and trek amongst yak herds on high Himalayan altitude treks in the Land of the Thunder Dragon. Cultural festival tours can be styled around bicycle travel, bird watching, architectural wonders, traditional weaving and textiles, orchids and tropical flora, archery, and eco-tours. Trek the High Himalayan Mountains to remote villages. Experience serenity in the least deforested country in the world. Immerse yourself in this peaceful Kingdom where happiness is the lifestyle. Why pay more for a photo tour in Bhutan; ask about our Certified Bhutanese Photo Tour Guide Specialist; amateur photographers welcome! Exotic Bhutan Tours and Treks offers detailed, individual itineraries with discounts for students and seniors. Our English speaking Bhutanese guides will overwhelm you with hospitality and personalized attention. We specialize in small groups and travel in small vans with driver and guide. OPTIONAL EXCURSIONS: India, Indochina, Tibet, Cambodia, China, Thailand and Myanmar. Exotic Bhutan is a certified Tour Director and Travel Agent and can assist you with your Air Ticket and Hotel arrangements. Life long memories and friends are made in Bhutan. 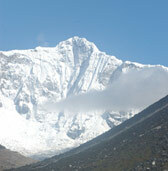 Tours and Treks are all-inclusive and ALL BHUTANESE. Bhutan celebrated 101 years of Monarchy and became a Democracy in year 2008; (Bhutanese style). In year 2008 Bhutanese locals, royalty, foreign diplomats and guest honored the Coronation of His Majesty, the King Jigme Khesar Namgyel Wangchuck. Bhutan’s history is steeped in elaborate religious purifications and celebrations; thus Bhutan always maintains its National Gross Product; “Happiness”. Come and visit Bhutan to experience a land like no other, where Peace and Happiness remains in an undiluted culture steeped in simplicity and pristine nature. Add any of our treks to itineraries to enhance your adventure in Bhutan; custom itineraries are my specialty. Experience Shangri-la in the High Himalayans and immerse yourself in unlimited HAPPINESS and ADVENTURE. Misfortune is gone and Good Luck will follow. Note: Itineraries listed on the site without dates are examples of the actual tour that can be arranged for your enjoyment. Please contact us and we will send you detail tours designed to your specifications. High Himalayan Trek with Two Festivals! Day 1: You depart in the early morning for your Bhutan adventure; approximately a 4-hour flight to Paro from Bangkok. Your flight path finally descends over the high Himalayan ridge bringing you to Paro International Airport, elevation 7,500 ft. Your Druk Air experience has been highlighted with breathtaking views of Himalayan peaks, including the sacred Mount Jumolhari and Jitchu Drake in Bhutan. Your excitement mounts and you are received by your tour representative; visas are processed. Drive to your hotel in your small vans as you meet your expert driver and English speaking Bhutanese guide. Welcome to Bhutan! Check into your Bhutanese style cottage and enjoy lunch. This afternoon we will tour the TA Dzong, the National Museum of Bhutan. Once the watchtower for Rinpung Dzong, it was converted into the National Museum in 1968. The museum stands on a promontory overlooking the Paro valley in all its glory. On the way back visit the Paro Rinpung Dzong. A flagstone path rises gradually from a beautiful wooden bridge with shingle roofing and abutted by two guardhouses, to the dzong. Today the Dzong is the seat of the district administration as well as home for the monastic school. The central tower (Utse) of the Dzong, displays superb woodwork. Evening rest and relax at Hotel Oltahang. Go over itinerary with your guide. Today after you check in at the airport, you will board your plane for a spectacular flight into Bhutan. Ascending over the High Himalayan Mountains you view in awe the sacred Mount Jumolhari, "The Goddess Peak" and Jitchu Drake. Excitement mounts following your descent in altitude over a large mountain ridge. You have arrived at Paro International Airport, Bhutan, altitude 7,500 ft. Your visa will now be processed and you are met by tour representative. Check into your quaint Bhutanese style Paro hotel and then we enjoy our lunch. Converse with your expert Bhutanese guide and go over your itinerary. We then depart to visit the National Museum (Ta-Dzong) once the watchtower for Rinpung Dzong. It was converted into the National Museum in 1968. The museum stands on a promontory overlooking the Paro valley in all its glory. On the way back visit the Paro Rinpung Dzong. A flagstone path rises gradually from a beautiful wooden bridge with shingle roofing and abutted by two guardhouses, to the Dzong. Today the Dzong is the seat of the district administration as well as home for the monastic school. The central tower (Utse) of the Dzong displays superb woodwork Evening stroll through Paro town and dinner at a local cozy restaurant. Overnight: Hotel Paro. Day 1: Bangkok to Paro: You depart in the early morning for your Bhutan adventure; approximately a 4-hour flight to Paro from Bangkok. Your flight path finally descends over the high Himalayan ridge bringing you to Paro International Airport, elevation 7,500 ft. Your Druk Air experience has been highlighted with breathtaking views of Himalayan peaks, including the sacred Mount Jumolhari and Jitchu Drake in Bhutan. Your excitement mounts and you are received by your tour representative; visas are processed. Your driver and English speaking Bhutanese guide will take you to your hotel for check in and lunch. You will then depart to tour Ta National Dzong Museum. Once the watchtower for the Rinpung Dzong, it was converted into the National Museum in 1968. The museum stands on a promontory overlooking the Paro valley in all its glory. On the way back visit the Paro Rinpung Dzong. A flagstone path rises gradually from a beautiful wooden bridge with shingle roofing and abutted by two guardhouses, to the Dzong. Today the Dzong is the seat of the district administration as well as the home for the monastic school. The central tower (Utse) of the Dzong, with its superb woodwork; Welcome to Bhutan! Overnight Paro hotel. Disclaimer: The sample itineraries detailed on the pages of this website are examples from past tours and treks. Actual details and dates of your trip may vary.